WCO is thrilled to announce its new young professional group, Young Washington Concert Opera (YWCO)! Are you a young professional with an interest in attending live classical music? Do you know a young professional who does? Consider joining Young WCO (YWCO)! YWCO is all about exploring and enhancing the enjoyment of Washington D.C.’s vibrant arts community. Members (ages 21-45) will receive tailored benefits including invitations to exclusive events (such as house parties, pre-performance happy hours, lectures, external social gatherings and more), access to specially priced tickets for all WCO performances at Lisner Auditorium, discounted tickets to WCO’s Annual Spring Gala and Cast Parties, membership to The Guild for Washington Concert Opera, volunteer and community outreach opportunities, and a subscription to WCO’s eNewsletter. Whether you are a seasoned opera enthusiast or a new fan, we would love to have you as part of the WCO family! We're back! Get ready for the Second Annual Opera Outside, once again jointly presented by Washington Concert Opera and Washington Parks and People! Join us for a casual outdoor concert on the upper field of Meridian Hill/Malcolm X Park, featuring selections from WCO's upcoming season, along with other operatic and musical theater favorites. Performers will include local tenor, Joshua Blue (tenor), Maria Valdes (soprano), and David Hanlon on the piano. Blue is currently a Domingo-Cafritz Young Artist with Washington National Opera and was a semi-finalist in the 2018 Metropolitan Opera National Council Auditions. Hailing from Georgia, Valdes was an Adler Fellow at San Francisco Opera with many notable performances there, as well as in Houston and Atlanta. This event is FREE and open to all ages. Come and go as you please, and come as you are. Bring your children and pets! Bring a blanket and/or chairs so you can enjoy the music in comfort! Plan on joining us? Don't forget to stop by our table near the Joan of Arc statue on the day of the concert and say hello! You can also register to win free tickets to our 2018-19 season online (concertopera.org/outside) or in-person at the event! Washington, DC — 8/17/2018 — Washington Concert Opera today announced that it is a grantee recipient of Bloomberg Philanthropies’ Arts Innovation and Management (AIM) program. The invitation-only program seeks to strengthen the organizational capacity and programming of small and mid-size cultural organizations within Atlanta, Austin, Baltimore, Denver, New Orleans, Pittsburgh and Washington, D.C. Through the $43 million multi-year initiative, Bloomberg Philanthropies will provide unrestricted general operating support as well as arts management training in areas that include fundraising, strategic planning, marketing and board development. the funds to address their greatest needs. Click here to learn more about WCO's exciting upcoming season and to purchase tickets and subscriptions. Washington, DC (August 10, 2018)– Washington Concert Opera (WCO) is excited to announce its 2018-2019 lineup, a season that celebrates strong women and the return of beloved opera stars. WCO kicks off the year with their second annual Opera Outside at Washington D.C.’s Meridian Hill/Malcolm X Park on Oct 27th, followed by performances at Lisner Auditorium of Charles Gounod’s Sapho on November 18th, 2018 and Gioachino Rossini’s Zelmira on April 5th, 2019. Also, for the first time ever, WCO will co-present two very special performances of Frank Martin’s Le vin herbé at The Barns at Wolf Trap on February 9th and 10th, 2019. Following in the footsteps of last year’s inaugural Opera Outside event, WCO will stage another performance this year at Meridian Hill/Malcolm X Park in Northwest Washington D.C. Though details of who will perform are still being finalized, the performance is free to the public and will take place at 11:00 am on October 28th, 2018. On November 18th at The George Washington University’s Lisner Auditorium at 6 pm, WCO will open its official season with Charles Gounod’s Sapho, a tragic tale of love, deception and the high power of art. The WCO performance of Sapho will mark the first-ever professional premiere of the opera in the United States. Sapho centers around intense, competing love affairs developing within the context of the ancient Greek Olympics - while a political coup bubbles just beneath the surface. Internationally renowned mezzo-soprano Kate Lindsey will return to the WCO stage in the title role while four acclaimed emerging artists (Addison Marlor as Phaon, Amina Edris as Glycère, Musa Ngqungwana as Pythéas, and Brian Vu as Alcée) will make their WCO debuts. On April 5th at 7 pm, again at Lisner Auditorium, WCO wraps up their season with a performance of Gioachino Rossini’s Zelmira. The last of Rossini’s “Neapolitan Operas,” Zelmira is largely considered to be among his greatest works. Embarking on a mission to save her father, King Polidoro, from a murderous usurper, the title character faces a series of aspersions directed against her and nearly loses her family and her life in the process. Lawrence Brownlee, one of the world’s leading bel canto tenors, returns to WCO as Zelmira’s husband Ilo. Celebrated Spanish mezzo-soprano Silvia Tro Santafe will make her company debut in the title role, while distinguished mezzo-soprano Vivica Genaux joins the cast in the role of Emma. WCO will also co-present with Wolf Trap Opera two performances of Le vin herbé at The Barns at Wolf Trap, lead by Maestro Antony Walker. The opera is a rare modern retelling of Tristan and Isolde in a chamber music setting, by Swiss composer Frank Martin. The performances will take place on Saturday, February 9th at 7:30 pm and Sunday, February 10th, 2019 at 3 pm. Single ticket and subscriptions for WCO’s performances at Lisner Auditorium are available for purchase online here and by phone at 202 364-5826. Single tickets range from $15 for students to $110. Tickets for performances at The Barns are available for purchase online (www.wolftrap.org) and by phone at 877 965-3872. We are pleased to announce our 2017-18 season of two bel canto rarities. The season begins with Vincenzo Bellini’s La Straniera on Sunday, November 19, featuring three rising stars in their WCO debuts: soprano Amanda Woodbury as Alaide, tenor Gerard Schneider as Arturo, and mezzo-soprano Corrie Stallings as Isoletta. Also joining them is WCO favorite, baritone Javier Arrey, in the role of Valdeburgo. The season ends on Sunday, February 18, 2018 with Gaetano Donizetti’s Maria di Rohan, featuring soprano Marina Costa-Jackson in the title role, tenor Norman Reinhardt as Riccardo, baritone Lester Lynch as Enrico, and mezzo-soprano Ginger Costa-Jackson as Gondì. All four will make their WCO debuts. All performances will once again take place at Lisner Auditorium on the campus of George Washington University. Season subscriptions will be on sale starting in mid-May 2017 and can be purchased by calling (202) 364-5826 or online here. 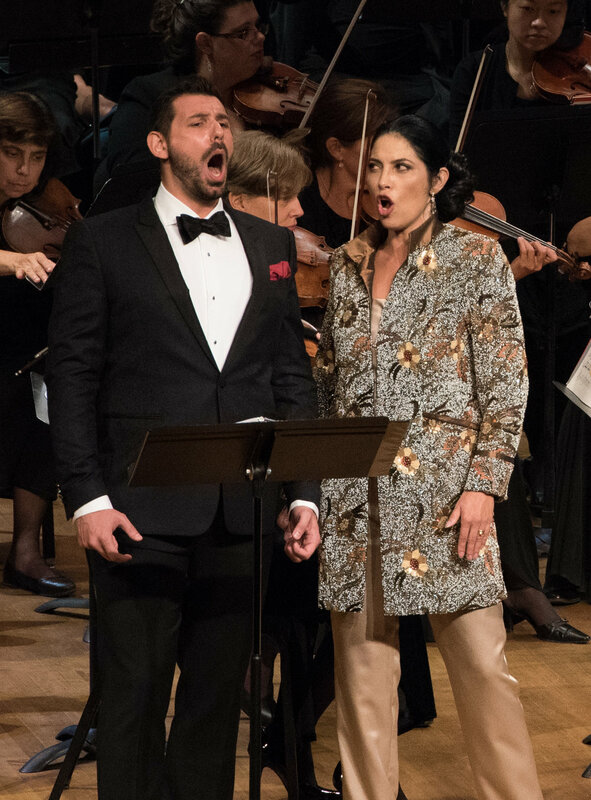 WETA interviews the stars of Sunday's performance (Massanet's HERODIADE), Michael Fabiano (tenor) and Joyce El-Khoury (soprano), together! Hear the full interview with Deborah Lamberton here and join us for the show starting at 6pm. Tickets still available. Photos from our 30th Anniversary Concert ! The Board of Directors of Washington Concert Opera is pleased to announce the appointment of Caryn Kerstetter Reeves as its new Executive Director, effective August 22, 2016. Ms. Reeves comes to WCO from The Glimmerglass Festival where she has served as Associate Director of Institutional Advancement since October 2013. “The Board believes Ms. Reeves brings wide-ranging skills and experience to the Executive Director position which will greatly enhance WCO’s marketing, development, artistic and business operations. We are excited about Washington Concert Opera’s future with Ms. Reeves at the helm and look forward to her leadership in maintaining WCO’s long-held reputation for artistic excellence,” said Melissa Rhea, WCO President and chair of the Board. Antony Walker, WCO Artistic Director, said: "I'm looking forward to working with Caryn. She will bring sound development experience, a thorough knowledge of opera and performing arts organizations, and a thoughtful, confident and youthful personality to WCO." Caryn Reeves said: "I am greatly looking forward to my time with Washington Concert Opera, an organization I’ve long admired for its compelling musical programming and performances of the highest caliber. It is especially exciting to join the company for its 30th Anniversary Season, and I plan to continue and expand upon the excellent work that has already been done over these past three decades. It will be wonderful to celebrate with all of WCO's friends and supporters on September 18, which I know will be a memorable evening!" Prior to her work at Glimmerglass, Ms. Reeves served for two years as Development Officer for New York City Opera. Ms. Reeves has a Master of Music in Voice Degree from Indiana University Jacobs School of Music and holds a Graduate Diploma in Opera from the Royal College of Music in London. She received her Bachelor’s Degree in Applied Music from Eastman School of Music. Ms. Reeves will succeed Ursula Kuhar as WCO’s Executive Director. Dr. Kuhar, who is returning to academia, has provided WCO with significant growth opportunities and expanded community outreach during her tenure at WCO. She will be leaving July 29, 2016 to return to her alma mater, Indiana University, where she has accepted the position of Lecturer of Arts Administration in the School of Public and Environmental Affairs. WCO is also pleased to announce the promotion of Adrianne Eby to the position of Chief Operating Officer, effective as of July 1, 2016. Ms. Eby, who has been with WCO for over three years, will provide management continuity during the executive transition process. We welcome her leadership in the commencement of WCO's 30th Anniversary Season - and Antony Walker's 15th anniversary as WCO Artistic Director - in September, and will be sorry to lose her contributions to our management team when she departs for the Boston area in the fall. What an incredible season for WCO! From the bel canto brilliance of Rossini's Semiramide to the drama of Donizetti's La Favorite, and everything in between, we have had a magnificent year. Explore some of our favorite moments--on and off stage--below. Because of you, we are able to present critically acclaimed performances of rare operatic masterpieces, be an integral part of the DC community and school programs, and champion emerging and established artists. Consider making a gift today to help us continue and grow our mission and vision based programming and initiatives. Don't miss out on next season, celebrating our 30th Anniversary and 15 years under the artistic leadership of Maestro Antony Walker. Subscribe today and we look forward to seeing you at the opera!